Last month, Google attempted to siphon some interest from Apple by holding a press conference introducing "the next dimension of Google Maps" just days before Apple's preview of iOS 6 and its own mapping solution at its Worldwide Developers Conference. Among the announcements from Google were new 3D features for the company's Google Earth platform, features the company reported would be coming to iOS in an update to the Google Earth app in the coming weeks. A few days later, Apple introduced its new Maps app for iOS 6 which will include similar 3D imagery under the name "Flyover". 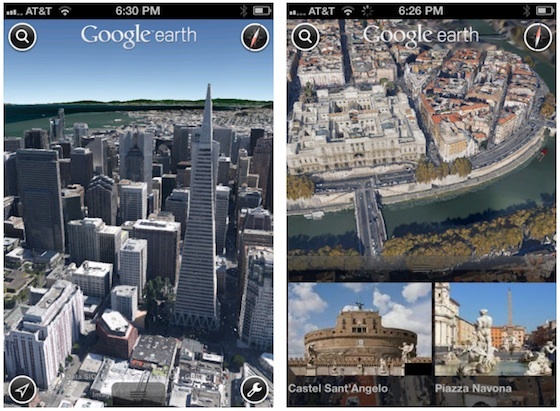 But with iOS 6 not launching to the public until later this year, Google has now beaten Apple to the punch, with CNET reporting that Google has released version 7 of Google Earth [App Store] for iOS to bring the new 3D imagery to the platform. Google today is updating its Google Earth app on Apple's platform to include the same 3D imagery it showed off in early June. That same feature rolled out to users on Google's Android in late June. iOS users are getting those same 14 regions, including Los Angeles, the San Francisco Bay Area, Boston and others. As Google adds more 3D cities to its database, both those platforms will get them at same time. Google is looking to quickly expand the feature, planning for 3D coverage of 300 million people by the end of the year and many more beyond that. The new 3D feature of Google Earth requires an iPhone 4S, iPad 2, or third-generation iPad, but older devices can continue to use the other features of the Google Earth app. I was thinking the same thing. Somehow Apple will get blame for it though. So how does this 3D coverage compare to the current beta in iOS 6? How different is this than the current Google Earth? I hope so too, but I have confidence that both implementations will get better over time. It's a lot of fun, but I hope Apple's implementation is a little more polished.